The World is Not Enough is the nineteenth film in the James Bond series and sees Bond, played by Pierce Brosnan, return to protect the world from a nuclear bomb threat whilst protecting the heiress and daughter of an oil tycoon murdered at MI6. Directed by Michael Apted (The Chronicles of Narnia: Voyage of the Dawn Treader) and starring screen favourites as Pierce Brosnan (Tomorrow Never Dies, Die Another Day), Robert Carlyle (The Full Monty, Trainspotting), Sophie Marceau (Braveheart, Beyond The Clouds), John Cleese (Fawlty Towers, A Fish Called Wanda) and Judi Dench (Die Another Day, Ladies in Lavender). 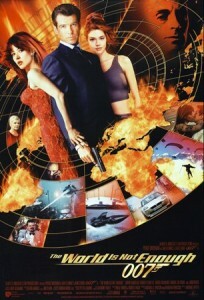 The World is Not Enough was a smash hit at the box office and became the highest earning James Bond film until Die Another Day was released in 2002. The film also won several awards for best film of its genre and best actor, Pierce Brosnan. The Historic Dockyard in Chatham was used as the location for a section of the action packed boat chase at the start of the film where the boat goes across a road, through a boat house and down an arched alleyway. If you look closely you can see Chatham High Street just before Bond sails past the O2. A popular filming location for the big and small screen The Historic Dockyard has also featured in productions such as Les Miserables (2013), The Golden Compass (2007) and the BBC adaptation of Oliver Twist (2007). The film was released in November 1999 and is now available to buy on DVD. This entry was posted in Filmed in Kent and tagged Denise Richards, feature film, John Cleese, Judi Dench, Pierce Brosnan, Robert Carlyle, Sophie Marceau, The Historic Dockyard Chatham, The World is Not Enough film locations. Bookmark the permalink.